He has since been released as the police said the shooting was “accidental. The Commissioner of Police, Bayelsa State, Mr. Asuquo Amba, made this disclosure while parading suspects before journalists in Yenagoa. The CP made no comment about how Akpusu came to be in possession of a gun. Amba said the victims of the accident sustained gunshot injuries in their legs and thighs. He explained that Akpusu was part of the ongoing masquerade in Ogbia kingdom, during which he shot two persons at Emeyal 1 and was arrested by policemen attached to the Kolo Police Division. He said the case had been moved to the Serious Crimes Unit of the state police command in Yenagoa. “Preliminary investigations showed that it was a case of accidental discharge at a masquerade in Otuoke and Emeyal area of Ogbia LGA. The victims are being taken care of by the suspect and the Ogbia people. It may have been a mistake,” Asuquo said. 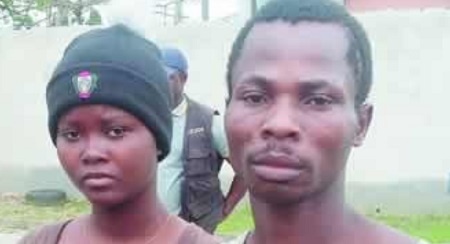 Meanwhile, a 35-year-old Bayelsa State resident, Preye Idan, and his pregnant wife, Divine, 18, have been arrested for armed robbery. They told journalists while being paraded before journalists in Yenagoa, the Bayelsa State capital that they ventured into crime because they had no other way of surviving. Preye, a father of one, who claimed to be a timber merchant, and his wife, were among 96 suspects paraded by the Bayelsa State Police Command on Wednesday for various criminal activities across the state. Preye did not betray any emotion as he recounted how he procured a pistol with live .9mm ammunition from a gunrunner. With the gun, he robbed a boutique at Biogbolo-Epie in Yenagoa metropolis forcing the owner, Juliet Uchenna, to hand over cash she had on her at gunpoint. He claimed that that day, September 21, 2017, his “spirit”led him to one Iro Royereyigha (30), his kinsman, whom he thought could help him out of his absolute poverty. Preye said he went in company with his wife, to meet Royereyigha to assist them to get a gun that they could use to carry out a robbery. He said, “We were so poor that we could not afford the basic things of life. There was nobody to help. That was why we thought we could break out of poverty by going into robbery for survival. That was our first time of carrying out a robbery. “I gave Royereyigha N1,000, when he handed the gun to me. He told us that after we carried out the robbery, we must give him N100,000 for the gun. Corroborating Preye’s account, his wife, Divine, agreed that both of them went for the robbery operation at the boutique. She said, “Both of us went to Royereyigha’s house. We actually asked for toy guns but he said he could not arrange toy guns but real ones. “The plan was that I should pretend as if I wanted to buy clothes and other items at the shop. In the process, my husband was supposed to come and threaten them with the gun. The plan worked as we conceived. “That day, we met two ladies at the boutique – the owner and one of her assistants. After my purchases, my husband came in with the gun and asked them to lie down on the ground. As they were lying down, he asked me to go and fetch a tricycle to enable us to escape. The police would later arrest Royereyigha, who confessed that he indeed sold the gun to the couple. The father of 11 claimed to have been influenced by the devil. When asked why he involved his wife in the business, the 38-year-old suspect replied that “it was the devil’s temptation”. But his 24-year-old, wife, Abazi, a frozen foods dealer, lamented that if she knew that the bag her husband gave to her contained a gun, she would have raised the alarm. Amba, expressed concern over rising cases of illegal possession of firearms, cult activities, robberies, kidnapping and sundry crimes in some parts of the state.